The Port Gamble S’Klallam Tribe was interested in more complete and accessible data about the services provided to community members and the opinions of Tribal members. There had been a consistent concern expressed by the Tribal grant development staff, planning staff and Tribal Council about the challenges in getting timely and accurate data from community departments to support local planning and fundraising. Previous attempts to develop a consolidated data system had not been sustainable. In this project Marc Bolan Consulting worked with the Tribe on 1) the development, administration and analysis of a community wide household and individual survey, 2) identification and formulation of the performance measures for various programs in the community, and 3) the development of an online Tribal database to house aggregate and individual level data. Community Survey – the evaluation team developed a survey to gather information from Tribal members living on and off the reservation. Trained community members went to each household to interview family members gathering information on demographics and attitudes and perceptions about the community and local services. The survey served as a census, enumerating the number of residents, number of children and ages of those in different households. A full report summarized the data used for ongoing planning and grant reporting. Performance Measures – the evaluation team met with staff from different departments to identify performance measures that would provide information on the delivery and impact of local services. We discussed which measures would best describe the current program efforts and would provide a picture to the Tribal Council and community about the potential outcomes of these efforts. These data were often generated from program data systems and would be compiled on a quarterly or annual basis. Tribal Database – the evaluation team worked in collaboration with GeoEducation and Research on the creation of an online data system would house aggregate and individual level data for many programs. In this system departments could enter information on the performance measures and other departments without their own system could use the platform to manage data on their individual clients. 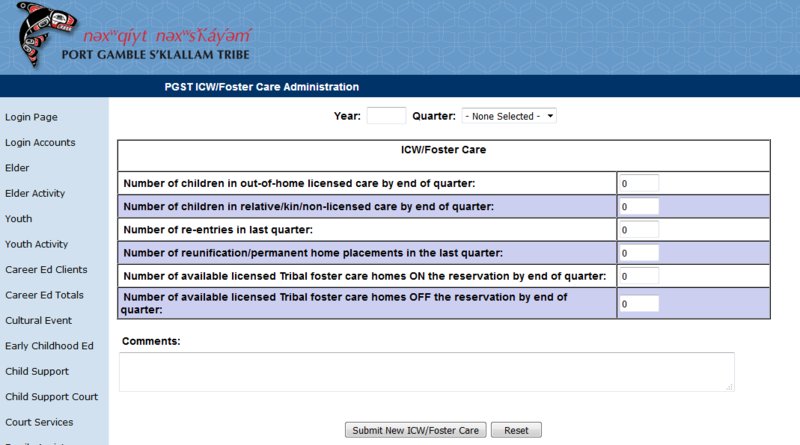 The system was further designed to provide stock reports and graphs where Tribal Council, grant writers and staff from other programs could see data trends over time for all departments. Please see an example of a data entry form and an example report of performance measures .